My name is Stephanie Zonis, and welcome to Whey to Go! Every month, we’ll delve into a new cheese-related subject, and I’ll offer a recommendation on a cheese I love. Chances are, if you live in the United States, you do know Jack—Monterey Jack cheese. But even if you know the name, what is Monterey Jack cheese? Jack is commonly used in cooking, as it melts beautifully and its characteristic mild flavor makes it ideal as a base for other flavors (pepper Jack cheese, for instance). Even those who know Jack well may not know the confusion surrounding the history of Monterey Jack. Supposedly, Spanish missionaries who came to California in the 1700s made a cheese that they called queso de país, or country cheese. After the missionaries had gone, local farmers continued to make this cheese, which evolved into a product similar to the Jack we know today. By the latter half of the 1800s, queso de país seems to have been a well-known and widely accepted local product. 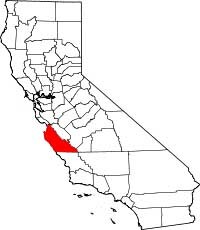 One claimant to the origin of Jack was Domingo Pedrazzi, who lived in Carmel Valley, in Monterey County, California (Monterey County is highlighted in the map of California at the right). It is said that, during the manufacturing process, Pedrazzi’s cheese required an application of pressure, something he accomplished with a device called a “housejack.” It’s easy to see how this name could have been shortened to result in the name of the cheese. There are also stories of an enterprising woman named Dona Juana Cota de Boronda, who began selling what would become known as Jack cheese door-to-door after an accident left her husband incapacitated and she became the sole support of her family—15 children as well as her husband and herself. Map courtesy of Wikipedia. Those tales are part of the legend. What is known is this: In 1882, a Scottish immigrant with a colorful past and a reputation that varied considerably (depending upon whom you asked) began shipping queso de país from his dairies. This cheese was branded with his last name and its city of origin, Monterey. The man’s name? David Jacks. The “s” in his last name was dropped somewhere along the line, and people began asking for “Monterey Jack,” a name that was made official by the FDA in 1955. According to the California Milk Advisory Board, Monterey Jack is the most popular cheese invented in the U.S. There are more than 50 cheesemakers in the state of California today, and greater than one-third of them produce at least one type of Jack. In fact, Monterey Jack is so loved that it’s also made outside of California, in states from Vermont to New York to Wisconsin. Zinfandel. Here, Vella Special Select Dry Monterey Jack is shown with Moulin Bleu Goat Cheese (left) and Fiscalini Bandaged Wrapped Cheddar. No matter where Jack is made, it’s a semisoft cheese, with an ivory to pale yellow color and a flavor similar to American muenster. The exception to this is aged Jack which is also a pale yellow color, but has a texture firm enough for grating, as well as a sharper flavor. Semisoft Jack is available in endless varieties, from habañero to chipotle to caraway, from garlic to hickory smoked to smoked salmon. No wonder this cheese is so popular; it isn’t possible to become bored with it! If you don’t use it as part of a cheese board or for snacking, it’s ultra-versatile in cooking, as well; a quick internet search will yield dozens of recipes. Plain or flavored, as a between-meals nibble or part of a main course, this adaptable cheese deserves its good reputation. Use it often enough, and your family and friends may have to admit that you do, indeed, know Jack. Sources: Recipezaar, Monterey County Historical Society, Real California Cheese, San Francisco Gate, Cowgirl Creamery. You’d think the U.S. would have more Monterey Jack than Americans know what to do with; but even in a country where so many cheesemakers produce Jack, Vella Dry Monterey Jack stands out. The cheese is produced in small (eight-pound) wheels, which are soaked in brine for several days, then air-dried for a number of weeks. A special mixture of oil, black pepper and unsweetened cocoa powder is rubbed all over the exterior of the wheel, which is then aged for at least seven to 10 months. The theory is that the oil prevents cracks from forming in the rind of the cheese while the cheese loses moisture during the aging process and shrinks in size; the black pepper and unsweetened cocoa powder keep the oil droplets in a suspension and stop the oil from seeping through the rind into the paste (the interior of the cheese). I suspect that the black pepper may also serve as a deterrent for fungi, bacteria and other similar organisms as well. 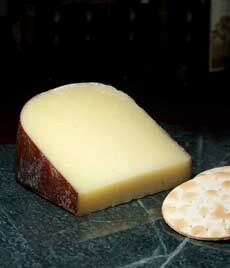 Vella Dry Monterey Jack. Vella Dry Monterey Jack is pale yellow in color, with a texture hard enough for grating (the texture is often appropriately compared to that of a good Parmigiano-Reggiano). Don’t expect to taste the black pepper or unsweetened cocoa rub in the cheese itself. The cheese has an excellent flavor: It’s sharper than standard Monterey Jack, with a nuttiness that the semisoft variety lacks. But the two types share versatility. Like its semisoft cousin, a good dry Jack can do almost anything in the kitchen. The cheesemaker suggests using it in toasted cheese sandwiches, soufflés, omelets, pasta, soups or tacos. Of course, you can also enjoy it by itself. Vella Special Select Dry Monterey Jack is aged for one-and-a-half to two years, creating a firmer texture and more complex flavors. 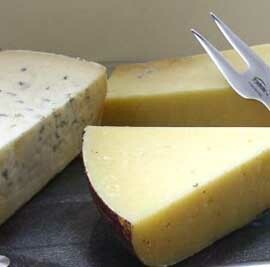 It can enhance any cheese plate; the cheesemaker recommends it with fruit, wine and pasta entrées. 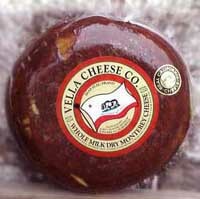 Vella Cheese also produces a Mezzo Secco (Partially Dry) Monterey Jack, aged for three to four months. It is a “retro” cheese, first made in the 1930s in the days of the ice box, when customers wanted a cheese that was less runny than fresh Jack. When electric refrigerators became widely available after World War II, the company stopped making Mezzo Secco, but revived it in 1999. 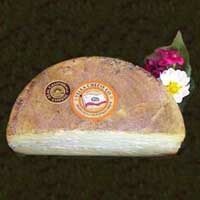 The company also makes Original High Moisture Monterey Jack. It has a soft, creamy texture like Brie. It is available plain and in four flavors—Caraway Jack, Garlic Jack, Pesto Jack and Rosemary Jack—which can be purchased in full wheels or in a quarter-wheel variety pack. There’s also a Partially Skimmed Monterey Jack with 30% less fat and cholesterol, that melts like Mozzarella and is the only skimmed Jack made in California. Many of the cheeses have won awards. Most flavors are available from a number of sources, but I prefer to order directly from the source if possible. Surf over to VellaCheese.com, and, while you’re there, have a look at their other products, too. This is truly a family business with a long and deservedly proud history. Try a piece of each Vella Jack with the 75th Anniversary Box. See website for additional selections. 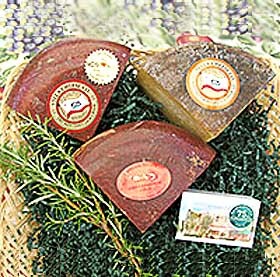 Cheeses available at cheese stores and fine retailers nationwide (gift box at VellaCheese.com only).